A couple of people asked for pix, here and on FB, so prepare for full-on (mega-newbie) nostalgia. My first char (can’t make another until tomorrow) is a crafter, which means she’s going to spend the next 3 days sampling till her lekku fall off. Because no resources = no crafty = no money, and you can put those in whichever order you wish. Currently I’m running artisan survey mission in between sampling because those training NPCs must live in gold-plated mansions in Kadaara when they’re not busy fleecing poor saps just off the space-boat. Oh this brings back SOOOO many memories! If I weren’t so involved in SWTOR I’d be getting back to my roots with the SWGEMU. 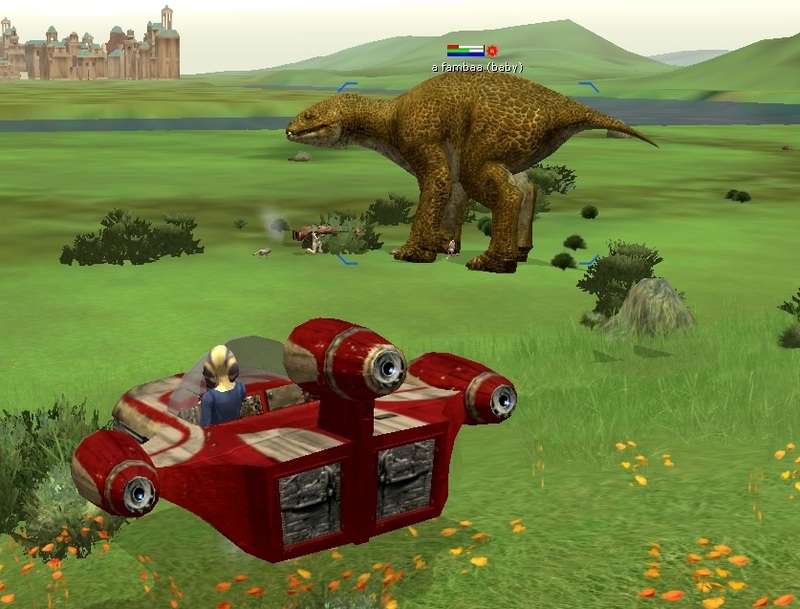 I have fond memories of doing speeder races around Jabba’s palace, running from player city to player city, getting into real fun RP sessions that were total sandbox greatness. Man the nastolgia! I may have to come back to it someday. 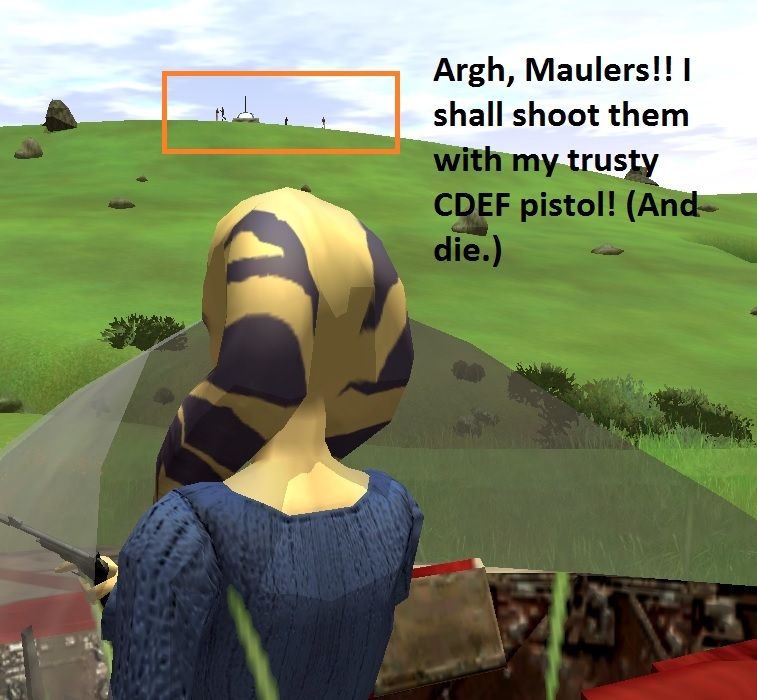 Again, still very very involved with SWTOR at the moment, but It’s awesome to see people still have a love for the pre NGE SWG! YOU ROCK! I made some kickass DH-17s back in the day on Shadowfire… But the one profession I’ve sworn to (try to) avoid this time around is WS. That grind was epic and not in a good way. Of course I’ll need meats and hides, I’m going to be doing every profession in the book except WS! There are apparently tons of non-SWGEmu servers out there, but SWGEmu runs two: a Test server and Basilisk, and this latter is where we’re playing. I probably didn’t even remember to link them, did I? Here’s the instructions page, which is very well done and very quick to do. You’ll need an account on their site too, it’s what you use to log into the game. 10 chars per server per account (so 20 total, 10 Basilisk / 10 Test) BUT if you do make it in, there’s a 24-hour character creation/deletion timeout, so if you make *or* delete a char you have to wait 24 hours before you can make another. Every attempt resets that timer too, to counteract some newbie exploit people did awhile back. So basically plan your characters out if you’re an altoholic like me. Makes no difference in the long run of course, just for starting. I’m IN and my spouse is also on the way in, but he had to delete his first guy and will have to wait. Yikes I hope it doesn’t do a day for every attempt that said you cant do it, it’s a server problem. Eek. Have my characters planned and lined up. Tailor/Image Designer next and looking at all of the Speeders blowing up around town, I may have to have an Engineer. It is, it’s a full 24h from the last attempt made, successful or not. It’s to counteract an exploit where people made a ton of new chars to get the 1k credits every time. Sort of a stupid exploit imo, but what do I know. I sadly have to work today to make up for the last 2 days of slacking, but I’ll be in as soon as poss. Bah, wish I chould play today! Join us, Stroppster! I mentioned somewhere that one could “””recover””” one’s old disk by using something that rhymes with St-Laurent. I know it’s not kosher and it’s not something I would normally do, but I kept those disks for TEN YEARS only to chuck them when we moved 18 months ago. I wasn’t prepared to spend $60 on obtaining a new one (esp. when I’d bought 3 copies back when). And OMG it’s fun. Even the bugs are cute (and I mean the glitches, not the kreevols). I’m glad I’m a hoarder! I haz a brain itch, and found them on a shelf under a stack of music CDs. Installing now… woo hoo! Stropp the Scout starting on Tattoine. See you there! Test went down too, then came back up, then went back down. I am a sad, petless almost-CH.